Krono Mini Fillo Shell - 15 per pack -- 12 packs per case. The pre-baked small fillo shells can be filled with anything savory or sweet to create a delectable two-bite treat. 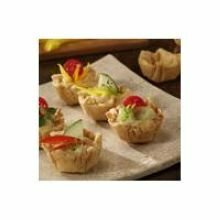 The pre-baked large fillo shells are elegant carriers for cheeses, fruit or quiche - perfect for appetizers, entrees or desserts. If you have any questions about this product by Krono, contact us by completing and submitting the form below. If you are looking for a specif part number, please include it with your message.